A Town Called Panic would be an easy film to dismiss at face value. 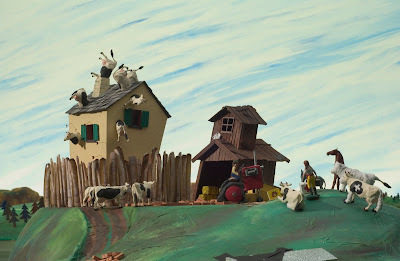 Running a scant 75 minutes, and animated using tiny plastic figurines, it almost seems like material for a short film rather than a feature. In fact, it is based on a cult, Belgian television series of the same name that ran for 20 episodes back in 2003. Its television roots are readily apparent in its episodic nature, but in that case it's an asset rather than a hindrance. Creating an emotional connection to a few expressionless plastic figures would be difficult to do. So instead, filmmakers Stéphane Aubier and Vincent Patar set up a series of loosely connected comic vignettes that ends up becoming one of the year's most ingenious and audaciously original works. The film is centered around the adventures of Cowboy (Aubier), Indian (Bruce Ellison), and Horse (Patar), three figures who live together in a brick house in a town called Panic. The town is aptly named, as all of its plastic citizens seem to be in a constant state of panic for no apparent reason, running frantically from one place to another and yelling everything as if the world is about to end at any minute. On this particular day in Panic, Horse's birthday is coming up, and Cowboy and Indian want to do something special. The problem is that Horse is the sensible one of the household, and Cowboy and Indian are, well, somewhat inept at life. So while Horse is away wooing the local music teacher, Madame Longray (Jeanne Balibar), Cowboy and Indian decide to build him a barbecue, but instead of ordering the 50 bricks that they need, they accidentally order 50 million bricks, and end up with a giant pile of bricks they have no use for, and in order to get rid of them stack them up on top of their house. That, of course, doesn't work out so well, and soon Horse, Cowboy, and Indian all find themselves homeless when the bricks crush their house. Luckily, they have 50 million bricks to rebuild with, and begin the project straight away. But something strange is happening in Panic. Someone is coming in the middle of the night and stealing their new walls. Every time they begin again, their house disappears. Becoming increasingly annoyed, Cowboy, Indian, and Horse decide to investigate and catch the thief that is stealing their walls, and embark on a journey that will lead them under the sea, and to the ends of the earth and beyond to rescue their walls and save the very town of Panic itself. It's all completely ridiculous of course, but that's what makes it wonderful. 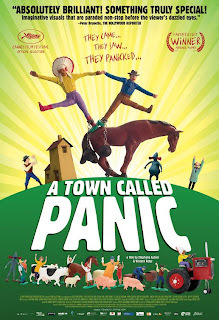 A Town Called Panic is a hilariously inventive comedy in the best absurdist tradition. Its manic energy is both delightful and infectious, never wearing out its welcome. The short running time is definitely in its favor, never lagging or becoming tiresome. The style is so fresh and inventive that it's easy to forget all we are watching are plastic toys. 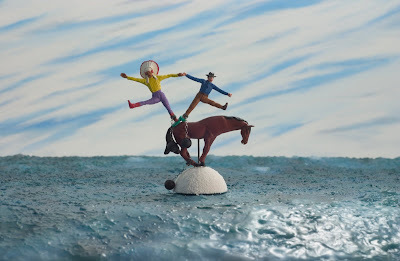 Aubier and Patar keep the humor fresh and consistent, bringing Cowboy, Indian, Horse, and their kooky neighbors to life with astonishing wit and charm, creating a fully realized world made of plastic and paper maché. It has been a particularly strong year for animation this year, from the childlike wonder of Ponyo, to the emotional maturity of Up, to the heart wrenching insights of Mary and Max, 2009 has had more than its share of great animated films. A Town Called Panic may not be as deep or as emotional as the other films I mentioned, but it may just be the funniest one of them all. Aubier and Patar aren't trying to make any profound statements about life or create any existential conundrums, they're just looking to entertain, and in A Town Called Panic, they have found a gloriously wacky avenue to do just that. A TOWN CALLED PANIC; Directed by Stéphane Aubier, Vincent Patar; Voices of Stéphane Aubier, Bruce Ellison, Vincent Patar, Jeanne Balibar, Benoît Poelvoorde; Not Rated; In French w/English subtitles; Opens today, 12/16, in NY, and in LA 1/29.